DONETSK, Ukraine -- From the narrow loop hole of a machine gun nest, a rebel fighter squinted towards no-man’s land and listened for the whump of artillery and the intermittent crackle of automatic weapon fire. 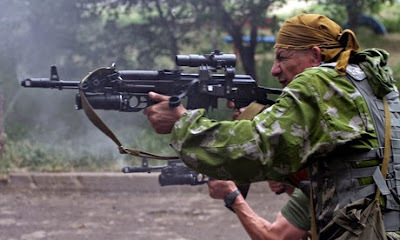 Pro-Russia rebels firing Russia-supplied weapons. From these trenches, the war in eastern Ukraine is seen in almost exact mirror image to that in the west: it is the Ukrainians on the other side who started the war; it is they who are still violating the ceasefire; and it is the Americans, not the Russians, who are stoking the conflict by arming proxies. But rebel soldiers here do have one thing in common with rank-and-file Ukrainians a few hundred meters away: an almost complete lack of faith in their enemy’s willingness to fulfil the Minsk peace agreement. “The Ukrainians will not keep to the Minsk agreement, we are certain of it - Poroshenko does not want peace,” said the separatist commander in charge of this stretch of the front line. It is that deep mistrust that threatens the success of what Angela Merekl called the “last chance” to end the war. A relative lull in violence here in the past few days has raised hopes that there could be peace after all. Ukraine said on Thursday that it would begin to withdraw heavy artillery out of range of the front, saying it had gone two days without taking casualties - a crucial sign the truce is beginning to work. The separatists announced the start of their own withdrawal on Tuesday. If both sides keep to the commitment, and the ceasefire holds, the diplomats may be able to work on the next stage of the deal: organising mutually acceptable local elections in a bid to build a lasting settlement. But the rebel fighters on this stretch of front already blame the Ukrainians for breaking the ceasefire. “They have been firing today from an automatic grenade launcher, but we have not answered because we see no point - yet,” said the commander. He may have been telling the truth. The sporadic shooting was a fair distance away and it was not possible to tell who was responsible for it. Several hundred metres from the Ukrainian army’s stronghold in the village of Peski on Donetsk’s northwestern edge, this warren of trenches and machine gun nests was at the centre of ferocious fighting just over a month ago. As an eight-month battle for the nearby airport approached its climax in January, the Ukrainians desperately resisted all efforts to dislodge them from the village and close the only supply route to the beleaguered garrison in the terminal buildings. A small businessman from Druzhkivka, a town now on the Ukrainian side of the lines, Zhora said he joined the separatist’s nascent army at the beginning of the uprising, after he saw “the deaths of children” at the hands of the Ukrainian army in Slavyansk, the rebel’s first stronghold. Vostok battalion, the unit he joined, has since swollen into a full brigade (Zhora commands about 130 men in the ninth company of its 3rd battalion), and is part of a separatist army that the United States believes is now larger than that of some European states and NATO members. But as far as the men of the ninth company are concerned, it is the Ukrainians getting foreign help, and it is America, not Russia, that is arming proxies. “Look at that,” said Zhora, presenting the nose cone of some spent ordnance that he said had hit a nearby house. “It bears latin lettering. There is no way that is from Ukrainian or Russian stocks. So they are definitely getting arms from abroad,” he said. There is evidence of Russian involvement in eastern Ukraine, but it is also true that, contrary to some statements from Kiev, many of the fighters on the separatist side are locals, and fighting for what they see as genuine grievances against the government in Kiev. “I joined in summer after they started shelling Donetsk,” said a fighter called Sergei. Like many, Sergei expressed scepticism that the Ukrainians would keep to their side of the peace deal. But even if Kiev keep to the agreement, the fact is many amongst the separatist rank and file are unhappy with its terms. In a compromise endorsed and negotiated by the rebels’ key backers in the Kremlin and signed by their local leaders, the peace plan envisages keeping the Donetsk and Luhansk regions inside Ukraine under a decentralisation deal that would grant them significant autonomy. After ten months of war, however, many front line fighters say that will not be enough. The mantra here is independence or nothing. Alexander Zakharchenko, the leader of the Donetsk People’s Republic, has repeatedly stated he wants full independence, although he has for now accepted the deal signed on February 12. “At a minimum we need all of the Donetsk and Luhansk regions. And I will fight until the criminals responsible for this are punished - by that I mean Poroshenko and the politicians who have destroyed Ukraine,” said Zhora.